ourselves comfortable, exchange ok's then continue the descent. wreck so I unlock the reel and venture out in this direction to go see. magically in front of us. this darn wreck. Oh well, might as well make the best of it. here and there. We arrived at the wreck in the middle of the port side. mintues then Josh thumbs it. I relay the signal to Nick and we start up. get from 200' to 150'. get every last bit of air out of my suit and wing. Fortunately I finally got settled down and from 50' up deco was pretty relaxing. rush from the time you jump in until you hit deco. Great fun, we need some wrecks around here! With flat seas, gear still soggy in our trucks from yesterday (see Big Sur expedition reports trickling in separately), and both our wives away for the day, what else could we do but go diving? After a lazy sleepin AM, Beto and I met up for a relaxing scooter dive at Lobos today. I've been bugging him to see if we can make our way out to the Great Pinnacle, so that was our target for the day. Crowded house at Lobos today and it took a while to stage all our scooters & bottles in the water. Dropped in the sand channel, headed north out of the cove, out past Hole-in-the-Wall, then northwest out to 3-Sisters. Tied in a reel at the far west edge of the 3rd Sister, short jump due west to a pretty ridge called Shortcut Reef. Tied off the reel, then used the ridge's natural navigation to guide us northwest towards our destination. After we ran out of reef, tied in reel #2 and after a 200' or so jump in same direction, boom, found ourselves looking up the face of the Great Pinnacle. Awesome! Vis had been nice darkblue 40-50' ish but out here it deteriated to a greener 25' ish with lots of particles in the water. We made our way counter-clockwise maybe a 1/3 of the way around the Pinnacle and still had plenty of gas in our stages but Beto wisely called it on time, knowing that we'd be slower picking up our line on the way home. On the way back, I detoured us briefly to invesigate an interesting rock outcropping in the sand and was glad I did. As I was rounding it, Beto flashed me - I had flown right over a monster Dirona Albolineata nudi. He measured it larger than his pinkie to thumb spread, maybe 10 inches. When we veered back to our route, its cousin was waiting for us in a little den on the wall, a bit smaller. These things are stunning. Lots of reports of these last few days, seems its Dirona season. In addition to the wonderful array of large usual suspects that make up daily diving at Lobos, we passed by a couple of monster California Sheephead patrolling thier territories, both male and female. Next best thing to cave diving, California diving at its finest. Here is a high level map of our route. Got up at 2. Yes AM. Got on the boat at 6. Got off the boat at 6:30. PM. Got home around 9. In between we had two pretty spectacular dives. The ride down was nice with several of us taking naps. We got to the general area at around 8:30 and started looking for spots. We found a pinnacle that topped at about 120' and was about 175' in the sand around it. Conditions were reasonable so all three teams went in right after each other. Beto and Susan went first, followed by Dave, Clinton and Pete. Nick, Will and I went in last. Going down there was a bit of current and it was pretty green. By the time we got down around 70' it opened up and on the bottom the visibility was a pretty honest 60-80'. The reef itself was awesome. Lots of vertical relief, lots of Hydrocoral, lots of color. Just cool in general. I'll let the people who actually know what they are looking at describe in more detail what they saw. I do know that towards the end of our bottom time we ran ito Pete, Clinton and Dave and Pete was trying to get us to follow them, but we were out of time. Turns out they found a Giant Pacific Octopus that was bigger than the one they ran into the previous week in Carmel. Had we understood what they found we probably would have extended things a bit, but they were unable to find it anyway so we didnt' miss out. After our gas switch at 70' I shot a bag and in retrospect the next 30 minutes remind me of the Hemmingway's "The Old Man and the Sea". At first the bag started pulling a bit and I figured that it was the swell. If I didn't let a bit of line out it was going to start pulling me up so I let more line out. And more. And more. By the time we were at our 50' stop the 150' spool was pretty much all out and Will handed me his reel and I ended up letting out another 50' to 100' of line out. Finally as we got up around 30' or 20' I was able to start reeling it back in and got back to being right under the bag. At first I thought that perhaps our bag had got caught on the shot line and we were drifting. Now I can only guess that the current was going two different directions at different depths. In between dives, Phil and Marcos dove the same pinnacle. We motored around for awhile looking for another spot and finally found a "different" pinnacle within 300' of the first one. The second dive was a repeat of the first. Visibility was if anything better, but it was darker I think due to the layer getting thicker. A few divers thought that we were back on the same pinnacle. I'm not sure, but I don't care. I would dive that pinnacle every day for a week and be pretty happy. The ride home was uneventful except for the sleeping bodies strewn throughout the boat. It was a great day, but a REALLY LONG one. Dionna should get major kudo's for spending the whole day on the boat helping out. Also, as usual the crew was on the Cypress Sea was great. Sue and I did a different dive today. We dove a place called Flag Rockfish Triangle. 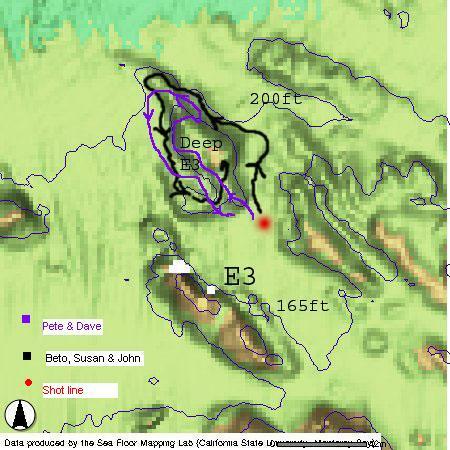 This is a site we have wanted to dive for awhile but never had the right mix, right conditions, etc. Today was perfect. The ocean was flat, there was not much of a current and we were invited for a dive on board Voytek's RIB "gozilla". 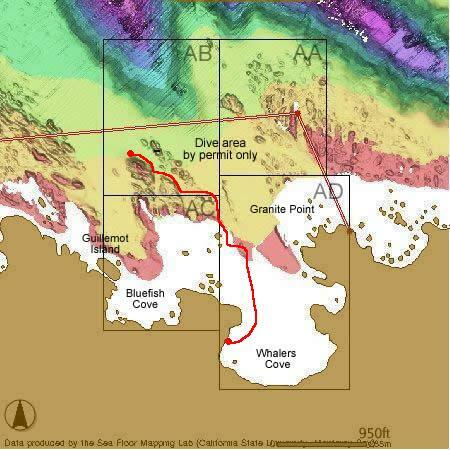 The site is located 3/4 mile north of Aumentos Rock inside Monterey bay. It's 400 ft x 200 ft area located in 220ft of water. The sand is at 226ft and the top is 215ft. Not a huge reef but there were enough rocks for marine life to attach. Once we reached the top of the reef we were greeted by huge metridiums covering most of the reef. Some of the metridiums were 3ft tall, and some of them were more of a yellow tone than white. As we progressed north on the reef we were surprised by several Flag rockfish under ledges on the reef. Most of them moved away from our lights but by covering our lights a little bit we were able to get very close to them. Beautiful fish, white with red-orange stripes. Also in abundance were longfin gunnels who were sitting on the top of the rocky shelves, and we saw at least 10 Spanish Shawls. Another highlight of the dive was the discovery of a couple of widely opened basket stars, one of which had a center of at least 2 inches in diameter. Amazing creature. We spent the rest of the dive checking the east side of the reef, where we found 2 rock crabs mating, then we ascended once we reached our predetermined bottom time. Visibility was 10-15ft at the surface and 25ft to 30ft at depth. No molas :-(. Joe and I got out and did a little diving this weekend, too. On Monday, we headed up to Tahoe to DL Bliss state park to rinse our gear. (No, really, I hadn't rinsed my gear since Wednesday's ocean dive!) I had never been to Rubicon and was looking forward to some cool rock formations, having seen Joe's video of the site. I wasn't disappointed! We put in at the beach and scootered for 20 minutes or so, playing around and speed matching as we went, across the sand in 10-40 feet of water. Then, we hit the drop off. Wow. We bombed down the sheer rock wall, pausing to check buoyancy periodically. Before I could blink we were at our planned depth - around 150 feet. We cruised the wall, ducking around pinnacles, cruising by massive cracks. It was hard to really get a sense of scale - I felt as small as the little crawdads tumbling down the rocks. At one point we saw a large dinghy on a ledge below us (maybe at 170-180 ft). It was pretty ripped up, making me wonder what happened to it. We were diving stages to save enough backgas for a second dive, so we switched to back gas as our stage gas ran low. It was pretty wild stage switching on a sheer cliff with blue all around compared to the well-contained cave passages we'd been stage diving in recently. We continued along around 150 ft in the same direction until we hit our planned bottom time (25 min), then ascended up the wall for our deep stops and our gas switch at 70 ft. We switched and started cruising back along the wall as we deco'd. Ten minutes into the deco we had passed through enough thermoclines to warm me up and I was really digging the brightly lit boulder field. There were several schools of fish who parted for our scooters as we slowly ascended, all the while traveling back along the wall. The timing worked well to finish our deco about when we reached the end of the wall and we finished ascending in the sand flats next to an anchored boat (where we wouldn't get run over). This was a cool dive at every depth. Unfortunately, the surface swim is long, so it is most fun to scooter or get a kyack ride out there . We decided to skip the second dive and beat traffic back over the pass, but it was a completely worth while day! With very flat swell model and gray skies we were hoping for stellar N.Monastary conditions, but they weren't quite as excellent as we expected. While searching for a minor leak in my drysuit before heading down, I managed to tear my neck seal. Arg, that has got to be the worst feeling in the world. After swinging by my house to pick up my backup suit, we got a late start out of Bay area and by the time we got to the beach the surf was pounding a little bit. South side was quieter and we hemmed and hawed about which side to do. The water looked a little green and the tide was favorable so we decided to tough it out by timing the sets carefully because we figured the depth offered by North side would lead to better vis. Turned out to be a reasonable plan, since the vis did open up fairly nicely below 50' and the waves quieted down a tiny bit during our dive so we had an uneventful exit. Diving as 2 teams, Mike and Kirk on singles, John & I on doubles we swam along the edge of kelp line and dropped parallel with the wash rock. Stayed together for one circuit along the deep shelf at 80-100' most of the time. John and I said farewell and headed back for another run. This time a large fat grey harbour seal kept us company on & off for the rest of the dive. At one point he put on quite a show snapping and munching a large fish right in front of us. Several large nudi's, some decorator crabs, and other usual suspects. Mike's previous experience at N.Monastary had been in the kelp shallows and he wasn't aware of the deep ledge at all, so the tranquility of the deep section was a new experience for him. "Huh, its so much easier to take pictures when the vis is good and things aren't moving around!" Ah, the joys of Monastary night diving! Speaking of which, here are some most excellent shots from his Canon S50. Swell model looked good and skys were gray so we decided a mid-week PM trip was in order. Bumped into Marcos at the shop who was reporting beautiful vis at the Pinnacles and flat water at Monastary - he even mentioned that they could see the bottom from the surface in Whalers Cove, so we were eager to get down there. On arrival, North side was looking a just a bit too rough but south side was nice and flat so we opted for that. After some home repairs on Dionnas flaky HID light we were ready for the hump over the beach. Peaceful entry, surfaced swam out about a 1/4 of the kelp line then dropped. Water was bit green and cloudy until about 30' depth then started to clear up. At 40-50' we got away from the surge and it was nice and clear. We headed out NW along the kelpline, foraging into to the kelp forest here & there to investigate rock formations, while keeping an eye on the sandflats for rays and other critters. Found a really cute eensy weeny octopus no bigger than a quarter who splayed himself out in terror until we left him alone. No sealions tonight, unfortunately. I've never had them not play with us at night before, they must be afraid of Dionna ;-) Temp and lack of p-valve for some team members made it necessary to come home eventually. On the way back, clouds of brine shrimp swarmed around our lights. Just before we were about to surface, we stumbled across a good size thornback ray in 16' of water who let us check him out for a nice long time - very cool. Dionna got introduced to the pleasure of v-weights and was also happy to discover that shore diving at Monastary in doubles can be a peaceful, relaxing event. A bit surgy but the water is looking good. Me thinks we're going to have a good weekend of diving! It must be an unwritten rule of diving that if you own an underwater camera, and dont take it with you, your bound to see something really cool! Arriving at the Breakwater around 8:30 PM, the water looked pretty flat so we geared up for a nighttime dip.We dropped down around where the sand starts to drop off at an angle, and after a round of S-drills we headed out.The viz was alittle murky, but we were both using 18 watt HID's which cut through nicely.Anyway, about 15 minutes into the dive, I caught sight of something moving right at the edge of our light beams.Lingcod? I moved a little closer, and much to my surprise it was a shark.It swam away pretty quick, just over the sand.It happened so fast I wasnt sure what type, but I thought it must have been a Leopard.I figured that must be the highlight of the dive, but was I in for a surprise later on!We cruised the base of the wall just about all the way out,then turned over the sand flats for the swim in.Saw usual cast of critters, octopus and lots of rockfish.I was swimming just over the bottom around 42 ft. when I played my light beam down, and right below me was a 3 1/2 ft swell shark.I could have reached down and patted it on the head with my dryglove! I couldnt believe it.He sat there for several seconds, then slowly swam in a big circle, heading away from the wall.It was gorgeous.Definatly the best night dive I've had in awhile.What are the odds of seeing a shark, twice, at of all places the Breakwater?!! once - not too bad. Metridium fields and decided to hang out and check out small stuff. tell us you have a bag. What, me? Oh a bag - sure I got one of those. get a chance to see exactly what kind. chose the west side. There is so much to see here its really something. Everywhere you look are steep walls and canyons filled solid with life. under a bag was nice and relaxing - all in all a beautiful dive. is a map that shows the routes we took. Many thanks Jim and crew for taking such good care of us on a rough day!